I've had my eye on this recipe for quite some time. And really, I couldn't have picked a better weekend to make it than this past one. It was hot. So, very hot. The kind of heat that gets you as soon as you walk out the door. This lemonade was the perfect bit of relief. Now you might think that basil and lemons sounds a little weird together because honestly, they do. But I assure you, it is a most magnificent combination when it comes to lemonade. If you only want a small hint of the basil use something close to 13 leaves, but if you love it like I do, use 20 or even more leaves. I'm making this again and putting in more basil because the lemon is quite strong. I also want to try a version substituting the basil for mint- we have tons in our garden. This was my first time making my own homemade lemonade and it was ten times better than any other I've ever had. The lemons made my house smell incredible, especially combined with the basil. When I tasted the syrup that you make with the water, sugar, lemon zest and basil I knew right away that it was going to be delicious! 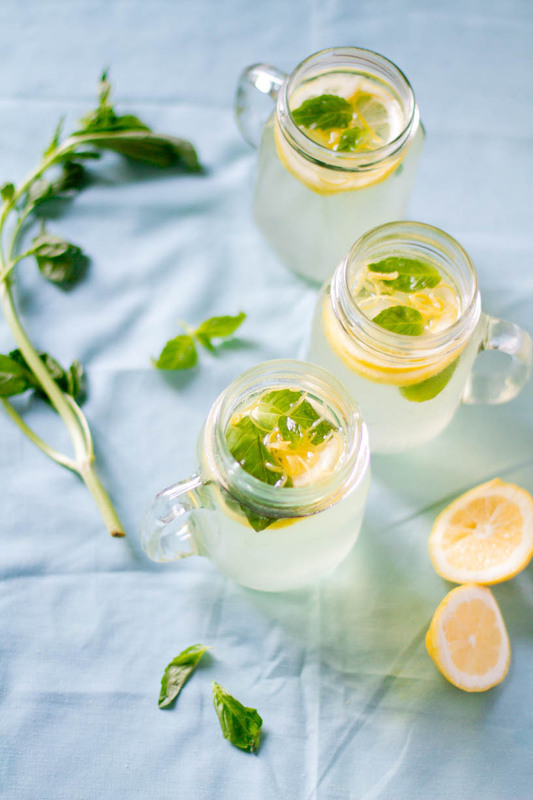 Add lemon slices to your pitcher or glasses and garnish with extra basil and lemon zest. This is the perfect recipe for a refreshing summer drink! Recipe adapted from right here.